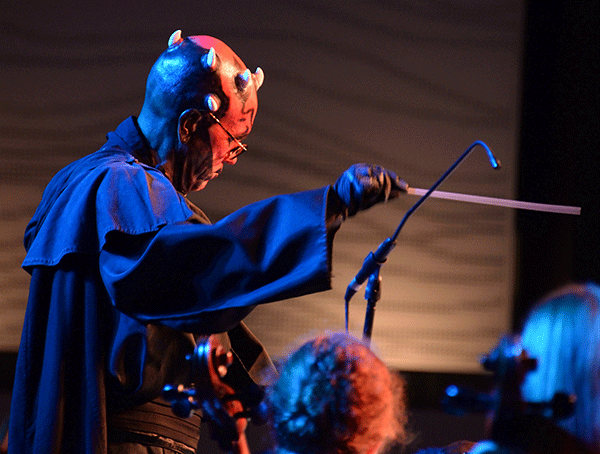 This is the third year the Georgia Philharmonic, conducted by John Morrison, has performed at Dragon Con. Each year, there has always been a level of barely contained excitement to the anticipation of the arrangement that will be performed. Each year, we think that it can’t get any better. Each year, we are wrong. It’s always better. Centennial II–II in the Hyatt was filled to capacity of over 3,000 people Saturday night as people waited for the lights to dim and the music to begin. After the orchestra was seated, Desmon, the narrator, came out on stage. His rich, deep voice thanked everyone for coming. He welcomed the orchestra. He then welcomed the conductor. John Morrison came out on stage dressed as Darth Mal. The audience went nuts and gave him a standing ovation. Morrison couldn’t help but smile. He was flattered at the enthusiastic response he received. The encore piece? The Avengers! Fans of Dragon Con and of this talented Philharmonic Orchestra look forward to a stellar performance again next year. In the mean time, if you live in the area or come to Atlanta during the year, you should check out their other performances. Their web site is http://www.georgiaphilharmonic.org, which will have all of their upcoming dates.